The aim of the programme is to provide the walker with a wide range of terrain and scenery with spectacular views of mountains, sea and the white villages. 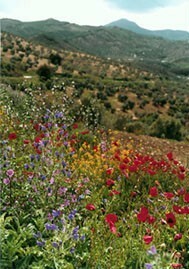 The walks cover different parts of the Axarquia – the name given by the Arabs to the region to the east of Malaga. The aim of the programme is to provide the walker with a wide range of terrain and scenery with spectacular views of mountains, sea and the white villages. We take you into still unspoilt mountain areas and along lush green valleys. The whole area reflects its Moorish past. Bird life extends to eagles and griffin vultures, while mountain goats and deer inhabit the quiet slopes. As we always have two guides, each walk can be tailor-made to cater for all levels of walking ability so that everyone gets the most enjoyment out of the experience. Price: 7 nights: £799.00 per person. Early bookers no single room supplement. 7 nights in traditional village houses, which have been both sympathetically restored and furnished with all modern conveniences and have their own shower/wc, washing machine, fridge freezer. All linen is provided and all the houses have beautiful terraces with views over the village, the surrounding countryside or the sea. or 7 nights in hotel – supplement for hotel, please ask. Transfers to/from Malaga airport if flight arrives by noon and departs in the afternoon (otherwise we book a taxi and €60 needs to be paid directly to the taxi driver). Picnic lunches on walking days. Dinner including drinks in local restaurants (except on rest day). Welcome breakfast pack (breakfast on self-catering basis). Transportation within walking itineraryGuided walks as per programme. Not Included: Flights, insurance and anything not mentioned in programme. Day 1: Welcome to Andalucia. We will meet you at Malaga Airport and transfer you to your house in Torrox Pueblo by private transport. After settling into your accommodation, you will join the other guests for a welcome lunch followed by an orientation tour and introduction to the history of village. Welcome dinner at Los Cantares. Day 3: Casa de la Mina. A gradual ascent with stunning views of Lake Vinuela. A great walk for wild flowers and birds and in January and February beautiful almond blossom. It is an easy walk but you are rewarded with panoramic views that include Maroma, at 2068m the highest mountain in Axarquia. 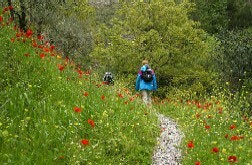 We continue walking through the Ventas de Zafarraya – a spectacular pass. 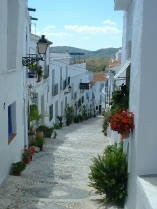 Then head down to the village of El Canuelo for a refreshment stop. The restaurant also has a swimming pool and we can relax and enjoy the views of Lake Vinuela below. Walking time: 5 hours – Distance: 12 kilometres – Grade: easy. Relax and take a stroll on the beach or hop on a bus to the vibrant, historic city of Malaga, including the famous Picasso Museum. In the evening, BBQ/Meal at a finca. Day 6: Lost villages of Acebuchal. Day 7: Canillas de Albaida. Day 8: After breakfast we transfer you to Malaga Airport.